WASHINGTON, April 4, 2011 — Japan­ese Defense Min­is­ter Toshi­mi Kitaza­wa today board­ed the USS Ronald Rea­gan to thank U.S. ser­vice mem­bers for their help since a mag­ni­tude 9.0 earth­quake and the tsuna­mi it caused struck Japan on March 11. The work of U.S. ser­vice mem­bers and oth­er Amer­i­cans is a tes­ta­ment to the half cen­tu­ry of tomodachi –- friend­ship — between the Unit­ed States and Japan, Kitaza­wa said as he shared a state­ment from Japan­ese Prime Min­is­ter Nao­to Kan.
Japan­ese Defense Min­is­ter Toshi­mi Kitaza­wa views a ban­ner cre­at­ed by U.S. ser­vice mem­bers in hon­or of Oper­a­tion Tomodachi dur­ing his vis­it to the USS Ronald Rea­gan, April 4, 2011. Among those hold­ing the ban­ner are Army Lt. Gen. Bur­ton Field, com­man­der of U.S. 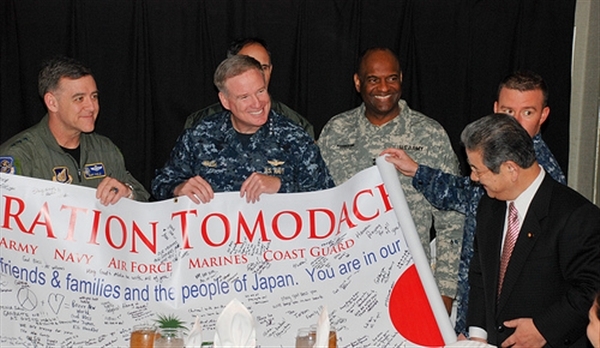 Forces Japan, and U.S. Pacif­ic Fleet Com­man­der Navy Adm. Patrick Walsh. “To all U.S. mil­i­tary mem­bers, on behalf of the peo­ple of Japan, I sin­cere­ly express my deep appre­ci­a­tion for the tremen­dous sup­port pro­vid­ed by the U.S. mil­i­tary, the U.S. gov­ern­ment and the Amer­i­can peo­ple at a time of unprece­dent­ed cri­sis in Japan,” Kitaza­wa said. The USS Ronald Rea­gan respond­ed imme­di­ate­ly after the dis­as­ter, and its sailors, as well as oth­er ser­vice mem­bers, con­tin­ue their human­i­tar­i­an mis­sion in Japan “with pride and pas­sion” and “are sup­port­ing Japan on an extra­or­di­nary scale,” he said. As of March 25, more than 1,000 sailors and Marines were deployed in sup­port of Oper­a­tion Tomodachi and had flown more than 450 mis­sions for recov­ery, trans­port and sup­plies dis­tri­b­u­tion, accord­ing to the U.S. embassy offi­cials in Tokyo. Kitaza­wa said he received a call from Pres­i­dent Barack Oba­ma right after the earth­quake, pledg­ing Amer­i­can sup­port. U.S. Ambas­sador to Japan John V. Roos was part of the del­e­ga­tion that includ­ed senior Japan­ese mil­i­tary offi­cials aboard USS Ronald Rea­gan today. “Look­ing out over this spec­tac­u­lar view, in front of all you great Amer­i­cans, I am awed to be here, and I can’t tell you how deeply moved I am by all you’ve accom­plished in the last sev­er­al weeks,” he said. Roos offered U.S. con­do­lences to the Japan­ese, not­ing that he saw the disaster’s effects first­hand in north­east­ern Japan. “One can­not even begin to imag­ine the dev­as­ta­tion until you wit­ness it your­self,” he said, “and even then it’s hard to imag­ine.